From the ancient Babylonian era, it is supposed that stars play a major role in forecasting the traits and the events occurring in an individual’s life. Even though it’s considered to be obsolete, a dozen signs of zodiac still uncannily predict human nature and forthcoming behaviors to certain situations. Yet, the ones who don’t share this opinion and find comfort in this often proceed to connect this to their love life. 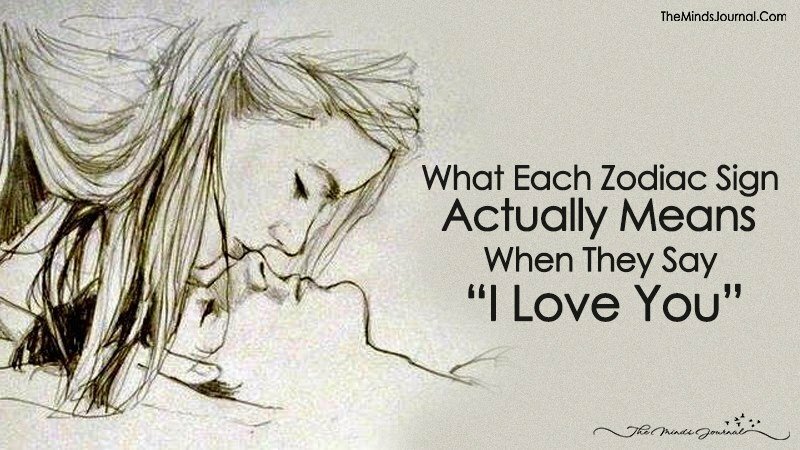 Here’s a brief guide to the meaning of “I Love you” through the perspective of a particular zodiac sign. An Aquarian possess dynamic and optimistic approaches, yet the word commitment is a huge phobia and they usually run away from serious relations. But once these fears have been conquered and the words “I Love You” leave their mouth, they will stand tall like a wall and stay with you forever. Just like their strong commitment to any task, they are intensely committed to their loved ones. Their love is as strong as a rock and every text, every glimpse, and their heart start thumping like a hammer hitting a nail. An I Love you from them just proves that you are literally their everything from the tiniest particle to the universe. People belonging to the zodiac sign Taurus, tend to be more cautious while making decisions in their life. Investing their trust in limited people and also showing their love for the opposite person is a huge achievement and thus an “I Love You” from them shows signs of comfort and trust in the person. Possessing a perfect blend of social and a confidential lifestyle, Gemini people end up discussing hot gossips, to their daily routines yet lacking understanding and emotional connection with their partner. Having a lack of clarity towards their own thoughts and decisions, it’s difficult for them to open up. Thus an I love you from A Gemini proves that you are the only one person in the world with whom they can be their Genuine Self around and can share their social and private talks. Trust Me That’s not really easy for the Gemini. Being overwhelmed and sympathetic ones in a relationship, Cancer zodiac sign people fall really deeply in love. Being as sticky as a chewing gum, they just won’t abscond the opposite person. So whenever they say, “I love you” they are basically saying that you are one of their priority and leaving them would break them. Being affectionate by behavior and nature, decisions are tough to reach because they see everything from one perspective. Being a people pleaser and attracting attention, finding and settling with someone is awaited call and thus an I Love You is the biggest achievement to receive. An “I love you” is equivalent to a bond, when it comes from a Virgo’s mouth. Being a safe and a well-planned sign in the whole zodiac, they demand a balance in their life and when saying I love you they look towards a future and are ready to commit. Not being able to grasp what others say – Leo faces one of the biggest challenges. Restricting them to themselves, they don’t look beyond their boundaries yet they take immense efforts to understand the one they are in love with, And I love you from them would mean that they break their boundaries to understand you. Adamant, apprehensive and manipulation are the keywords associated with Scorpios nature but fall on their good side and they are the most caring individuals and shield you from every possible danger. Staying away from huge crowds to show affection, and I love you is an important call from their side. Exemption and bliss loving sign always look for new roads and are highly unfocused about the future. While some of them are committed, the remainder believes in pouncing from one to another. Doesn’t mean that they aren’t the right one; just that their enjoyment is short lived. Putting career ahead of everything, being masters of their trade, Capricorn tends to struggle in the field of love. The main reason being that love would distract them. So if the words I love you are conveyed then are ready to be a part of a great success story.